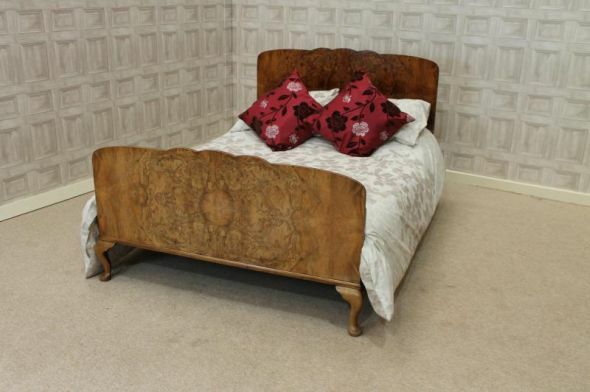 A fantastic example of extremely rare Art Deco bedroom furniture in burr walnut. This magnificent seven piece set consists of a large triple door wardrobe with pillow fronted design, hanging space to the left hand side, and fitted slides and drawers to the right. This wardrobe breaks down into three individual sections for ease of access. This is complemented by a smaller wardrobe with hanging space and fitted interior. The set also comes with a large kidney shaped dressing table with three mirrors and matching bergere style stool. This is glass topped for added protection. This item is also in excellent condition, except for some small blemishes to the mirrors. The bedroom suite also has a matching pair of bow fronted bedside cabinets. These also have glass tops for added protection. The suite is finished off with a double burr walnut bed which comes complete with a newly made pine slatted bed base. Unfortunately, the bottom of the bed is slightly faded. This can, however, be re-polished as it has been lightened by the sun. A fantastic opportunity to purchase a large amount of Art Deco bedroom furniture which will complement any period bedroom interior. We do offer a two man delivery team; delivery charge applies.